I just saw this again at the Bagdad with the kids. A cool bizmo gets a cameo. Nick was waiting outside the theater on this warm-for-February Academy Awards night. I shared my sense Ayn Rand would've liked this film about extraordinary individuals caught up in an oppressive "no powers allowed" mediocracy (like Harry Potter & friends escaping muggles through Hogwarts), but Nick mainly just liked the good family vibes, a scarce commodity in his scenario. I'm not a big Ayn Rand reader, mostly just The Fountainhead in like 8th grade (looked interesting, plus I detected raised eyebrows among the adults). I was much more into Freud (called him Frood until people figured out whom I meant). My friend Trevor, a true scholar, has been studying Ayn's 'n Bucky's thinking for signs of convergence/divergence, plus he's dug into the technocracy movement with gusto (found a great video). Trevor (many years my junior) is one of my favorite teachers -- always expanding my horizons. That's what The Incredibles reminds me to be (not that I need much reminding): grateful for the many differently abled superheros in my life (corny but true), all average joes and janes on the surface (such perfect disguises). Last night I was introduced to a teacher of comparative education systems at the University of Oregon. He hails from Singapore, is an Austrialian citizen. He and Derek joined us at the Bagdad. I sampled the Dry Irish Stout but stuck with my favorite: Hammerhead. Just walking to the Bagdad had been a chore, as we'd been roller skating again, and this time I managed to wipe out big time. Some lower back muscle got very unhappy and is still giving me grief almost 24 hours later. The power walk up to Hawthorne was part damage assessment. I explained RSA along the way to keep my mind off the sharp stabs. Jimmy just brought over some Tiger Balm patches, plus I'm doing ibuprofen. I expect to be back to normal shortly. One of the things I remarked on at our booth was this bottle of vitamins I'd just picked up enroute to the skating rink, sporting a green label against a reddish background. 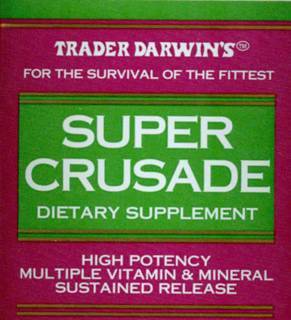 The green part says "Super Crusade" while the purplish red background says "Trader Darwin's". 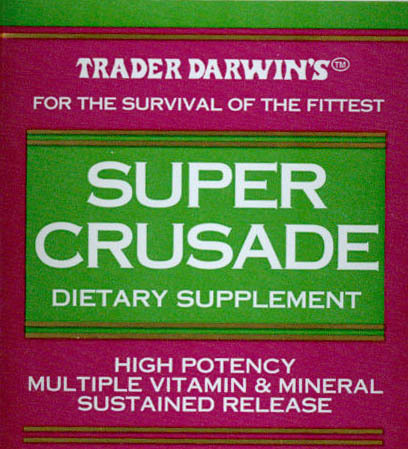 I found this an interesting juxtaposition of contrasting memes -- and passed out vitamins to whomever wanted 'em. Speaking of crusades, over on Quaker-P some scholarship (not mine) has unearthed a meaning of jihad amenable to Quakers. In fact, Bayard Rustin's "speak truth to power" might be construed as a reasonable translation of something Mohammed likely said: that to speak truth in the presence of a tyrant is what jihad is all about. I filed a post on that on synergeo on February 8th of this year. This is February? asks the front page of The Oregonian today. Indeed this is weird weather for us, but not unenjoyable. I've just been sitting out at a favorite cafe with Nick, getting briefed on the Amory Lovins talk of two nights ago. Fabik, freshly back from Mexico, joined us for lunch. Biofuels could be big in Oregon, especially considering how many trucks we make. OSU has already done a lot of the planning. Lovins is a 787 fan, sounds like (new Boeing model). Speaking of Boeing, another headline in today's paper: JetBlue is to start a nonstop service from PDX to JFK, using state of the art Airbuses (every seat has its own DVD LCD). Last night we watched the full moon rise over the Columbia, anchored off PDX. At dusk, that tower looks like something straight out of a science fiction novel, or maybe Lord of the Rings. So what's with those billowing black smoke fires again? They've been happening for years. Last Friday night, Dr. Philip Clayton did the ISEPP lecture, talking about the levels of discourse separating emergent levels of complexity. Philosophy floats atop science, with a lot of value-laden verbiage, and that's OK. As human beings, we're entitled to traffic at a higher level than reductionism might justify and nail down within empirical simulations. Life at the edge of chaos is just like that. After wine and dinner, I asked him about the Tower of Babel i.e. isn't it part of the design that we don't get totalitarian closure i.e. Universe always seems to escape complete systematization? It's a question I didn't get to bring up with Lyn & Dorion in the Hawthorne Pauling House that time (Terry did most the talking) -- was thinking about them cuz Clayton played us a DVD clip from Contact during his multimedia presentation (also a clip from 2001: A Space Odysseey -- the chimps' meetup with the obelisk). Anyway, yes, Philip thinks the Tower of Babel is semi-real. I haven't specified my bizmo in great detail because my plan is to field test a standard issue model, not a one-off, so that lessons learned have wider application than to just my team. That being said, a Google recruiter with family aboard wouldn't have the same features as a roving clinic and dispensary, or environmental quality tester. I imagine a typical class hierarchy per Java, with bizmo interfaces extending various subclasses of RV and touring coach, known quantities from whence the bizmos derive. Likewise I likely wouldn't own said bizmo. I envision the fleet having corporate ownership, with scheduling and maintenance more centrally managed. Just amassing a personal fortune, buying an RV, and outfitting it accordingly would unnecessarily delay the evolution of shared infrastructure, complete with control rooms providing OnStar-like support services. The whole point is to grow a fleet within a larger deployment plan. Bizmos do real work, after all. I'm not planning an early retirement. To the extent our source code remains a public good, early adopters such as the UN, various NGOs, could port, customize, and further develop the software. Competitive commercial ventures might add proprietary features. Making much of the infrastructure free, including access to relevant GIS, would stimulate the corresponding hardware market, with many multiplier effects. Given the USG has a history of strategically encouraging investments with ripple effects, I could see the NSF getting involved, among other agencies. Or maybe we should look at pioneering this whole business in Japan. There'd be a large export market. I'd be happy to field test various Made in Japan technologies. Nor must we think either/or. And yes, I hear you Korea. Let's all play world game. Today our presenter, Steven L. Jacques of OHSU, talked about optics in biomedicine, meaning the therapeutic and diagnostic uses of photons on tissues. Most of his talk focused on clever ways of using colored lasers, mirrors and digital filters to tease telling imagery from the body's surface and innards. Yes, it's a red letter day, and not just because it's Saint Valentine's. I just deposited a Portland State University (PSU) check made out to me (taxes withheld), a Fuller Schooler, for my work with Saturday Academy as an adjunct faculty member. I teach at the Oregon Graduate Institute (OGI), using a classroom belonging to Oregon Health Sciences University (OHSU). On Saturday, I used our projector to eye our classroom from further out, using Microsoft's Terraserver. We also played with new Elastic Interval Geometry applets, and went over some entry level group and number theory using Python, a nifty computer language. Last week, I completed an intro to Fuller's concentric hierarchy of polyhedra, embedded within its CCP context (if you're thinking CCCP instead, don't worry about it -- wires cross sometimes). Although the amperage is low (this was a token sum), the point is: a switch has been thrown and a current is flowing. This is a "go live" milestone along our critical path. A cool new circuit for our Motherboard Earth has commenced operations. So it turned out over dinner (we ate out as a family) that Dawn had been reading about Hildegard of Bingen. Without having read this blog entry, she brought up the importance of the color green in Hildegard's writings, and connected this to her own query "where's the green?" in a recent empowerment circle -- for her, an uncharacteristic use of slang (she was asking about travel money). I told her later how satisfying it was to hear all this green talk, having just written a blog entry that was thematically red -- including a subtle Biblical allusion that most wouldn't see. The juxtaposition of red and green, and of sacred and profane imagery, made for some interesting paper-into-gold alchemy. And speaking of checks, of course the Catholics have been paying me for years, through Saint Dominic Academy and later Saint Vincent Hospital. The breakthrough celebrated above was not the brute fact of getting paid, but rather the new set of university affiliates connecting up with the Fuller School to promulgate a new, higher quality curriculum. I caught up with Ron by cell yesterday around 5:24 PM; he was on a ferry back from a job interview in Victoria, BC. I phoned to clue him in about the upcoming segment on CBS about Willie Nelson's biodiesel bizmo. After quitting Collaborative Technologies at Free Geek, Ron dove head first into biodiesel, by volunteering at a local refinery and upgrading the family car. He'll view my tape when he gets home. Later that evening was another Python meetup at the Lucky Lab. Like last month, I showed up with one of Tara's stuffed snakes, so new registrants would be able to identify our table. This time, none of us were new. Scott, who goes back a long way in computers, has been implementing this dynamite search algorithm (I forget its name) which he claims outperforms just about any other when it comes to pawing through gigabytes of text. I've put him in touch with police at the computer forensics lab in Hillsboro, as he needs raw intelligence about how to fine tune his presentation. I'll also mention his project at an upcoming Wanderers meeting. Both Ron and Scott are running low on fuel, as each pursues a dream. They're both risk-taker capitalists, using their heads to score a net gain for themselves and others over the long haul. Speaking of capitalists, even our little Dawn Wicca and Associates is implementing stricter fiscal discipline these days, given new costs: we're cutting Sarah's day care at the Howladay Inn and sticking with Comcast's basic package, which includes lots of home shopping, but no Comedy Central and no SciFi Channel. Maybe we'll get Pentagon's new service at no extra charge (not counting taxes). Fortunately, the Fuller School knows all about doing more with less and has been moving ever further towards doing everything with nothing since Bucky died in 1983. This school is about as lean and mean as they come I'd hazard. Our network is strong and continues to make inroads. Our access to timely global data is increasing exponentially. So in the long term, I have every confidance that our risk taking will pay off handsomely, in terms of real wealth (= life support, actual and potential) for omnihumanity -- plus for dogs, wolves, tigers, elephants and like that. This was a powerful film. I left in a daze, leaving my OSCON bag at my seat, full of library books. The ticket taker was sympathethic when I went back for it. For the rest, I'll just cut and paste what I posted to Quaker-P (some listserv I subscribe to off and on). > although with some trepidation. I just saw it. Some Belgians suckered the Africans into believing in this distinction between Hutu and Tutsi, even though it made no sense. A lot of senseless killing ensued. I'll ask the same thing I asked David Niyonzima -- why not throw away these silly identifications and create a new ethnicity called "Hutsi" to which everyone belongs. Of coures it'd be arbitrary and silly -- just like before. Certainly those American satellites can't tell the difference -- and never will. Senseless killing they see, and record, no matter who does it (lets just say they're all Americans and be done with the senseless divisions, how 'bout it?). I went to the social security administration today, to get a replacement card. Against my better judgment, I checked the "white (not hispanic)" box on the SS-5 (I figured it'd raise fewer eyebrows at the desk -- I'm at the mercy of those bureaucrats). But of course I'm Asian to the core (duh). Or maybe Native American. PSU (a local school that pays me the big bucks) had a more enlightened form: I checked the "declined to identify" box. That was the least confusing. So the CEO in this case is "Power Boat Don," behind-the-scenes benefactor of The Wanderers, a Portland-based think tank to which I belong. He earned that nickname by taking us out, as individuals or in small groups, on the Columbia River, aboard his restored, mint condition, vintage power boat. Many CEOs don't use their boats. They buy one for status, as something to mention in cocktail parties, to prove their prowess. But actually putting out to sea is a big hassle, and not so much fun as golf, and so many a power boat just sits in the marina, under-used and under-loved (boats like to go boating). Anyway, Don loves his boat, and puts up with his cell phone, and uses the Columbia as his scenic headquarters for brainstorming about the future. Don is pretty smooth on roller skates (he can go backwards for example). He found me last night, lacing up my rented pair (size 14), at this rink in Oaks Park, not far from Humphrey Bogart's wife's ashes (or so Trevor informs me). This time slot was set aside for mature adults, and indeed most of them were more mature than I, and better at skating. Graying couples floated effortlessly, arm in arm. Khaki panted gentlemen (Intel engineers?) zipped past, leaving me figuratively in the dust (the rink's wooden floor is actually quite shiny and particle-free). A full scale wurlitzer was pumping out the tunes. This one guy circled the floor in an arms-out position, a soaring eagle (he even looked a little like John Ashcroft). One lady coasted up beside me and said she was glad to see she was not the only newbie in the rink. I nodded with a wry smile, and that little gesture almost tipped me over. But I kept my balance throughout the ordeal, not wanting to appear a disaster on wheels in the eyes of these seniors. Don and I repaired to a sports bar afterwards, to MacTarnahan's and a shared burger (they're really big at Stanich's, so one is definitely enough for two). We went over some of his notes about Wanderers, agreeing about our group's enormous potential, not to mention the many dreams already realized. One of my hopes was he'd be available to offer out-of-towners a spell on his power boat. Given Don supports Terry with the ISEPP lectures, this invitation might be extended to our big name speakers (many are on a tight schedule but still find time for fun -- Don shared about Stephen Hawking enjoying a ride in a sea plane over Seattle that time). However, I can imagine other lower profile guests, affiliated with Wanderers but without their names in lights on the marquee of the Schnitzer, yet nevertheless appreciating the view from our CEO's Columbia River vantage point. Don sounded quite open to this proposal. He's very generous with his time, an asset way more valuable than money. Some big name crystallographer in the UK (A.L. Mackay right?) bestowed upon Ed this "Ayatollah of the Tetrahedron" moniker. I took this picture about a year ago, at a Bucky Symposium at George Washington University, where I appeared with Ed and others on a panel. He was our guest of honor, the paradigm scholar and collaborator. In his keynote presentation, we learned of Edgar Allan Poe's Eureka, a metaphysical prose poem which connects to Synergetics on many levels. Ergo, said Ed, lets keep alive this great American literature of ours and pass it on to future generations. And that we shall do. 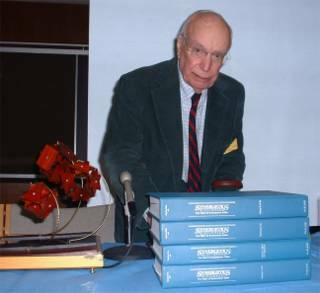 In the foreground is his four volume Synergetics Dictionary, a painstakingly and meticulously undertaken enterprise aimed at documenting Fuller's use of key terms. Teleology, for example -- Bucky had his own way of using it, in connection with the idea of voltage pressure (humans push to realize their destiny in Universe). When I first met Ed in Washington DC many years earlier, he gifted me with a copy. Matt and I drove it across country. I've treasured it (used it) ever since. We have lots of opportunities to synergize with cultures in those parts of the world where bona fide Ayatollahs grace the hallways. Islamic art is sometimes about tiling a surface with polygons, and in space, with polyhedra. Engineering and architecture are similarly about shapes, as is sacred geometry, which dates back to the pyramids and before. High level cultural exchanges, including of open source software (like SpringDance for example), and hardware (like big plasma screens), would show the world that geekdom, at least, is gaining a brain in the new Iran. Let the politicos rattle their sabers and say menacing things. We technogeeks already know the score, and want to get on with living our lives. I think Iraq's neighbors might want to help a friend by furnishing some of the props, skills and backing, as well as the subsequent television coverage. I'd love to see our geek counterparts, getting up to speed on these tools and infrastructure. If the USIA makes overtures, sensing a pro-democracy angle, well fine. But if it doesn't (because it's clueless -- or defunct), that's fine too. There's no reason to wait for a green light. This is about being free and independent. Want to map electrical grids on a Fuller Projection, and show it off in control rooms on TV? Go for it, why not? No one is stopping you (or me).